It hardly seems possible that we are now in November... 2016 seems to be flying by so quickly! I don't know about you, but colder weather always makes me want to go full on with my beauty routine from skincare to hair & make-up and everything in between. My lipstick choices get bolder, my smokey eye game gets stronger and I start doing a lot more with my hair. There's always something so fun about experimenting with a new eyeshadow this time of year or perfecting hat hair for crisp evenings when it's too cold to go out without a cute wooly hat... This month's beauty edit features a great product for hair, fab nail polishes a couple of fun makeup options and some quirky new finds as well! 3. When I curl my hair, I like to spritz it with a sea salt spray before I tousle it. It helps to create the wavy texture I love and helps to keep it in place too. I recently picked up the Toni & Guy Casual Sea Salt Texturising Spray and it's a really good high street alternative to the more expensive sprays I've tried in the past. This product retails for £7.49 and you can find it online at Superdrug. 4. I loved the Maybelline Blush Nudes Eyeshadow Palette so much that I had to go back and get the original Maybelline The Nudes Eyeshadow Palette and I love this one even more! For only £9.99, this gorgeous palette offers several rich shades, perfect for layering and experimenting and a few metallic or sparkly ones as well that are just right for the holiday season. I love this palette, but as I said previously about the Blush Nudes one, you'll want use better brushes or invest in some if you don't have them to get the full effect. Buy one for you and pick up a few for stocking stuffers or gifts for all the makeup loving ladies on your Christmas shopping list! You'll find the Maybelline The Nudes Eyeshadow Palette online at Superdrug. 5. It doesn't take a lot to convince me to eat candy, if I'm honest, but Beauty Candy is something rather exciting for ladies who love beauty and sweets! These little raspberry gummy bears contain Vitamin D, B6 and Folic Acid alongside collagen. These little sweet treats are tasty and who knows if they really work, but why not give it a shot? I did... They're tasty and I'll eat just about anything if it's safe and promises to make me look younger... I got a sample of Beauty Candy in a goody bag, but I found them for sale on Amazon here. 6. I once got a sample of a Makeup Revolution highlighter in a goody bag years ago and I never looked back... For just £3, all my highlighting and strobing needs are fully met! I've always used the Makeup Revolution Highlighter in Peach Lights, but I recently decided to branch out and try a new shade. Makeup Revolution Highlighter in Golden Lights is just as amazing! If you're a fan of NARS Albatross, this is a much cheaper, suitable high street alternative. I love how soft these highlighting powders are. The downside is that the compact lid has broken off every single time I've purchased one of these products, but to be honest, I love them so much that I simply keep them together with a small rubber band and carry on... After all, you can't expect perfect from such a low price tag. Makeup Revolution Highlighter is available online from Superdrug. 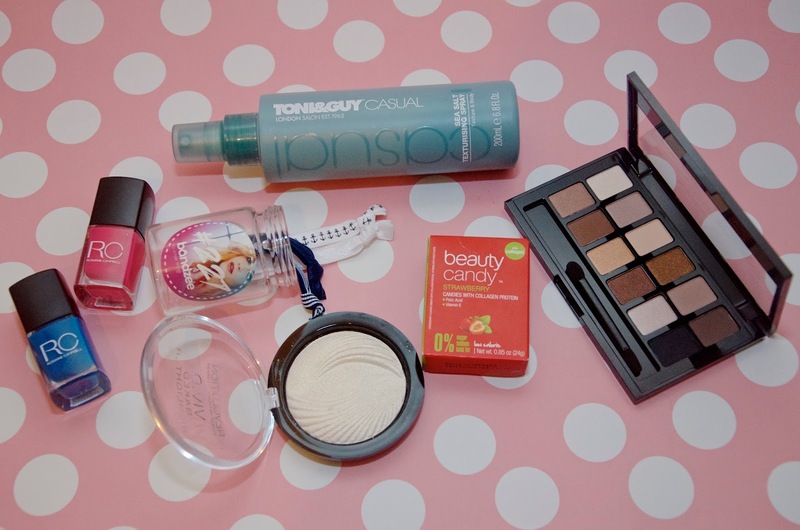 Have you found any new beauty products or cosmetics worth shouting about? If so, I'd love to read your recommendations, so leave a comment below.